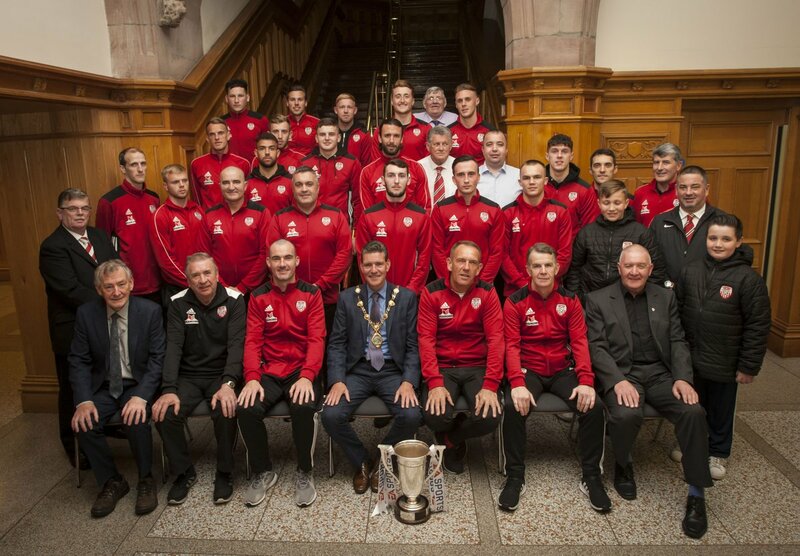 Kenny Shiels along with his players, backroom team and support workers were afforded a Mayoral reception in the city’s Guildhall on Tuesday night to mark the club’s recent success in the EA Sports Cup. Mayor John Boyle, himself a lifelong Candystripe fan, said he was delighted to have been at the cup final last month as well as now having the opportunity to formally congratulate the club on their win. “I’ve been supporting Derry City since before their League of Ireland days and it’s great to have you all here and with silverware on the table” he said. Manager Shiels took the opportunity to thank the Mayor for his kind words and support, but was keen to point out that there was plenty of unfinished business before the current season comes to a close.